king size bed with all nice bedding. with king sized , comfortable bed! 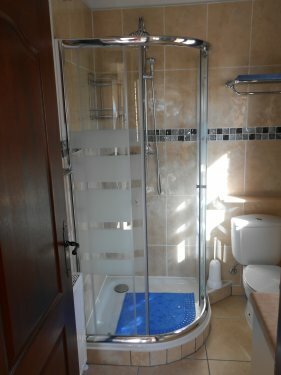 Luxury Self contained apartment with private sunny roof terrace. 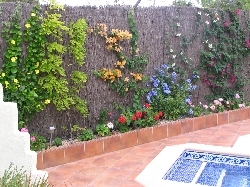 Villa Mimosa is on the Costa Blanca 10 minutes drive from either Moraira or Calpe both of which have blue flag beaches many restaurants , bars , shops and marinas. Also only a 10-15 minute walk to the nearest shop, bar and restaurant. 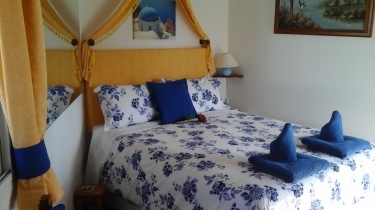 The apartment has recently been completely refurbished. to a very high standard and now includes central heating, Wi-Fi, Air conditioning and fans. The apartment is part of the owners villa over a large double garage and has a large Sunny private roof terrace with panoramic sea and mountain views, plenty of room for alfresco dining, with a Gas BBQ. The area around the apartment is Quiet and relaxing. 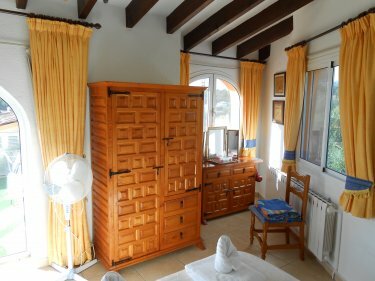 The apartment is set on the first floor,( no one above you ) in mature gardens with a heated pool for all year round swimming ,and a poolside terrace with sun beds. The setting is ideal for couples looking to relax or explore the area.. A generous welcome pack is supplied for guests including wine. The apartment is furnished to a high standard with English bedding and pillows and English Freeview flat screen TV.It has high ceilings making it light and airy during the summer months, and warm and cosy during the winter. Pool has just been refurbished. 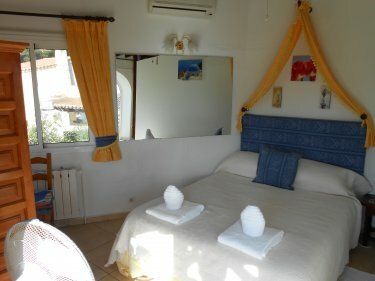 Villa Mimosa has to be the best apartment we have ever stayed in! We really don�t want to leave. The pool and surrounding gardens have provided us with exactly the super- chilled, relaxing environment we needed. It�s in a great situation to explore the surrounding area-lovely lunches to be had at Fustera beach! Near to superb restaurants � Rondos & Sataris in particular provide a memorable night out. Thank you, so much Jenny & Nige for providing us with a perfect holiday getaway. We have never spent a holiday in such a clean, well-equipped and beautifully situated apartment. The view from the terrace is exceptional. Every thing else cannot improve because it is 1st class. If you fancy golf, then try Javea GC- Not expensive. This has been our 4th visit & we will be back. Can�t be done, everything is here! Pool is spotlessly clean and you don�t smell of Chlorine! Our thanks to Jenny & Nige for the thinking of everything, to make the apartment so welcoming, even down to bacon & eggs. Special thanks to Nige for being our Knight in shining armour & rescuing us when we got wedged in the car park in town, over & above the call of duty!! The view, what can I say except we could sit on the terrace & look at it all day but then the lovely pool beckons & and drags us away! We have enjoyed our stay here, the weather has been glorious and the accommodation, first class such a joy to stay in an apartment without having to clean it first,10/10 for cleanliness and 10/10 for comfort & facilities, much appreciated! We shall return & recommend for sure. We loved the landscape, the people & the climate and felt we could have stayed much longer. We leave relaxed & bronzed! This is our 4th visit to Villa Mimosa, and yet again we can not fault the exceeding warm welcome and excellent hospitality of Jenny & Nige. 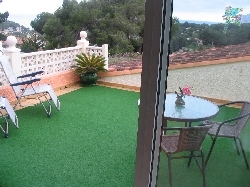 What with Jenny�s expert eye for detail in making the apartment a haven of comfort, and Nige�s loving attention to the fabulous gardens and pool area. This is a total �Gem� of a holiday experience. Thank you both & see you next year! Chris & Marianne. Pudsey Yorkshire. this is our first to �Villa mimosa�. What a beautiful place, with absolutely nothing left to chance, from the very thoughtful welcome pack, to the detail in every aspect, could not have asked for better. Jenny & Nige have been the perfect hosts and we now no why guests keep returning. 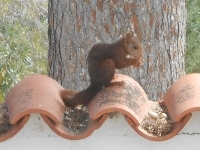 but hope to return next year to Moraira to �Villa Mimosa�. Please ask about special offers. Heated pool in winter, weather permitting £100 per week extra for heating it.